The rear camera display will activate when the back-up light is ON with the ignition switch ON and the shift lever in the R (Reverse) position. 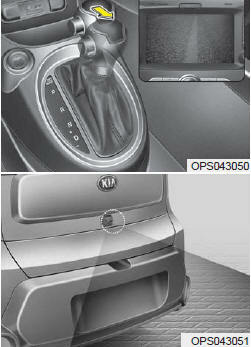 This system is a supplemental system that helps the driver by displaying objects behind the vehicle when backing up. The rear camera display is not a safety device. It only serves to assist the driver in identifying objects directly behind the middle of the vehicle. The camera does NOT cover the complete area behind the vehicle. While the camera's display is generally accurate, objects can be much closer than they appear in the display screen and can be distorted in both size and proportion. Never rely solely on the rear camera display when backing. You must always use methods of viewing the area behind you including looking over both shoulders as well as continuously checking all three rear view mirrors. Due to the difficulty of ensuring that the area behind you remains clear, always back slowly and stop immediately if you even suspect that a person, and especially a child, might be behind you.